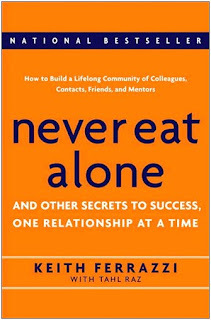 The book of the week was Never Eat Alone by Keith Ferrazzi. I can't remember the last time a book has motivated to change my lifestyle so much. This book was recommended by a friend of mine and has given me a new appreciation for the relationships in my life. The main idea of the book is to develop as many lifelong relationship as possible. Getting away from the casual acquaintance and start real solid relationships with depth and value. Additionally, each relationship you create should involve love, reciprocity, and knowledge. You need to love for the person you are in a relationship with (this is not a romantic love, but a genuine care of well-being for the other person.) You need to show reciprocity because you will only get as much as you give. And quite frankly, the moment you stop worrying about what you will get in return and start caring about how you can truly give, you will have everything you desire and more (you can still ask friends for what you want, you just shouldn't base your relationship off what you will ultimately get). Lastly, you need to share knowledge in each relationship. This will be the foundation of many great relationships in your life. You know something stuff they don't know, and they know some stuff you don't know so share your knowledge with each other and advance each other's lives. One idea I found incredibly useful in this book was that there are two parts to utilizing relationships to reach your goals. The first part is giving, like I said earlier, you need to give everything you have to people in your relationships. This will take a lot of time and energy, but it will be well worth it. It may include getting a friend an internship, or mentoring someone, or being a regular listener. Can you imagine what you would do for the person that got you your dream job, or introduced you to your "hero"? You would probably go to the ends of the Earth to give that person whatever they asked of you. And that brings me to the second part... Asking people in your relationships for what you need. If you want something and you know someone that can give it to you then you need to ask them for it. If one of you relationships has connections to you hero, ask them to introduce you. Too often people just don't want to ask, they feel embarrassed or they feel like they don't want to "owe someone." Well that's non-sense, if you have effectively created a solid relationship then you shouldn't have any problem asking someone for a favor. And so what if you "owe someone?" Personally, I love to help people... anything a friend of mine needs I will do my best to get it to them. In fact, this whole blog is dedicated to helping people. I have a sincere desire to help people get more money and be more successful. I am sharing my knowledge with the world and I am available to any of my readers for questions they might have. A quote from the book that particularly hit me was this: "Love, Reciprocity, and Knowledge are not like bank accounts that grow smaller as you use them. Creativity begets creativity, money begets more money, knowledge begets more knowledge.... And most importantly, giving begets giving"
I am going to attempt to kindle as many of my acquaintances into solid relationships as possible. I know that when I start doing this a lot of people will shy away and many won't respond, but the few that will may turn into very successful relationships. The more people I have strong relationships with, the more people I will be able to help in a personal way. 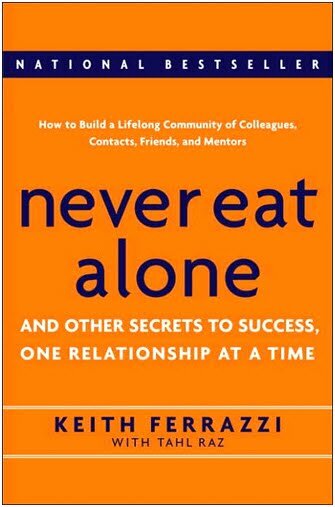 I challenge you to start building your own lifelong community of colleagues, contacts, friends and mentors. Pick up this book, everyone can take away great tips and ideas to incorporate in their own lives. It has very powerful ideas that will change the way you look at the relationships you have. The results will fill your life with everlasting success and happiness.Ferrazzi has an amazing story and you will most definitely another one of his books here in the not to distant future! If you have any questions on the book don't hesitate to ask. I would be more than happy to help anyone that wants it. Asking the Right Questions and Starting to Act!